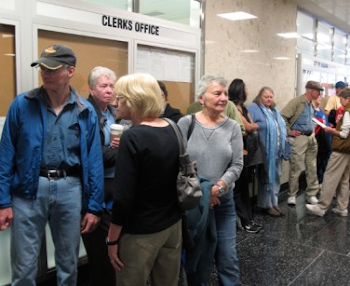 Today is the last day to cast an early, in-person absentee ballot for most Wisconsin voters. Although in some municipalities you'll still be able to cast an early absentee ballot tomorrow (e.g., in Milwaukee) or tomorrow and Sunday (e.g., in Madison). If you think there's a chance you won't make it to the polls next Tuesday, do not put it off, visit an early voting site and cast your ballot TODAY. Keep in mind that – if you are not already registered to vote – the deadline to register in person at your municipal clerk's office is 5:00 PM today. After today, if you are not already registered, you must register to vote on Election Day – next Tuesday, November 8th – at your polling place before casting your ballot. You can find out if you are registered at your current address at MyVote.WI.gov. If you need to register to vote, be sure to bring a proof of residence document (hard copy or electronic on your cell phone or tablet). For more information about early voting in your city, town or village, please contact your municipal clerk. If you are planning to vote next Tuesday, remember: Wisconsin Law allows you to take up to three hours off work to vote, as long as you notify your employer BEFORE Election Day. Though your employer is not obligated to pay you for that time off and can designate the time of day you leave to cast your ballot, they cannot impose any other penalty or refuse to allow you to take time off to vote. And don't forget to bring an acceptable form of photo ID for voting. You will need to present one of the acceptable forms of ID pictured here when voting in Wisconsin, so take a moment and check to see if you have the ID you need to cast a ballot early or on Election Day. If you don't have an acceptable ID, review the information on our downloadable fact sheet on voter ID and/or visit: Bring It to the Ballot. And do NOT give up on voting just because you do not have an ID! Our partners at VoteRiders can help you get an acceptable form of ID for voting from your local DMV. Just call one of these two voter ID hotline numbers for assistance: (608) 729-7720 or (414) 882-8622. CC/WI has both identified and recruited organizations and individual volunteers across the state willing to offer free rides to the polls. The latest directory of free ride options is available on our website here. If you are interested in being a driver or know of any groups in your area offering this service during this last week of early voting, on Election Day, or both, please contact CC/WI by email asap so that we can add them to our list! For links to more information about voter photo ID, college and university student voting, and for election protection hotline numbers, please visit the Voting Resources page on our website. Early, In-Person Absentee Voting Ends TODAY for Most WisconsinitesTweet this!